Here’s how to change and customize the font for email titles, row headings, and the body of messages in the Reading Pane of Outlook 2016. Most people know that they can change the color themes for Office 2016 for PC and on the Mac version. Changing the colors is a popular way to customize the look and feel of Outlook and other programs in the suite. But did you know you can also customize the fonts in the Reading Pane, too? 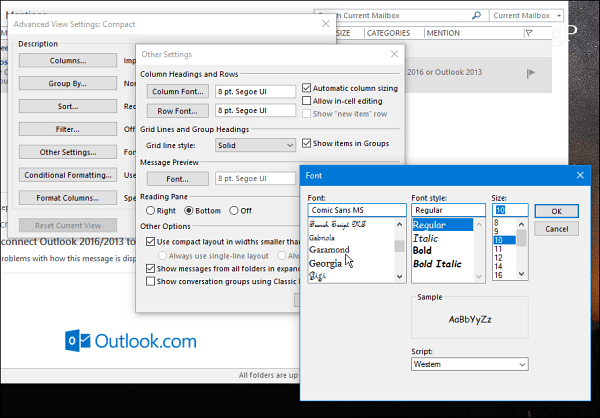 We already showed you how to customize fonts in Outlook 2010 but things have changed quite a bit since then. Here’s how to find this little-known setting to customize the font for email titles, row headings, and the body of messages. First, from the Ribbon select the View tab and then View Settings. When the Advanced View Settings window comes up there are two buttons to note that allow changing fonts — Other Settings and Conditional Formatting. 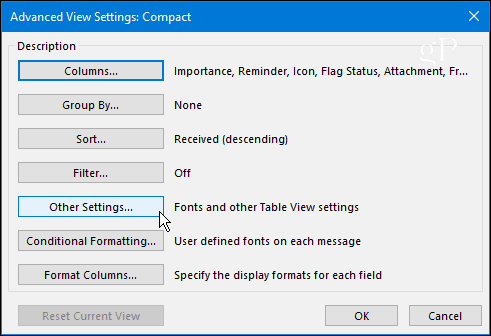 Other Settings lets you adjust fonts for column headings, Message Previews and more. For instance, I prefer my Reading Pane set to the bottom which you can set here or by going to View > Layout > Reading Pane and choose where you want it. 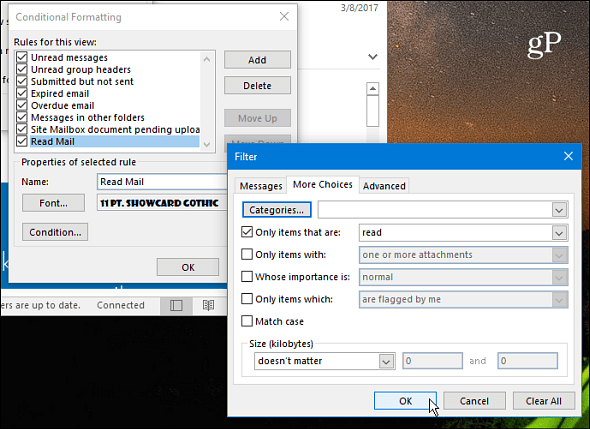 Just like with all versions of Windows, Outlook has a lot of redundancy when it comes to settings options. Go ahead and play around with different settings until you get the look you want. In the example below I changed the Colum, Row, and Message Preview fonts to everyone’s favorite — Comic Sans (and, yes, that would be a joke). Conditional Formatting lets you customize things based on email rules you have set up. By default, there are seven rules enabled that you can customize or add your own. You create a Rule by selecting Add > Condition > More Choices and then add your rule there. In the example below I created a Rule for only items that are read. Then I set the font to ShowCard Gothic. If you have a busy inbox, having the ability to customize fonts based on rules is a good way to make your most important mail to grab your attention. After making just a few tweaks this is what I ended up with in my Reading Pane. Of course, you can set things up for what works best for you and your workflow. Another setting worth pointing out is the ability to make the font in the message body larger. Just use the slider located at the lower-right corner to increase or decrease the font size. Or, select the zoom button and choose a specific size. Another way to zoom is to hold the Ctrl key while in the body of the message and scroll the mouse wheel up or down. Do you like to customize the Reading Pane fonts in Outlook? Leave us a comment below and tell us what works best for you. WOOHOO! 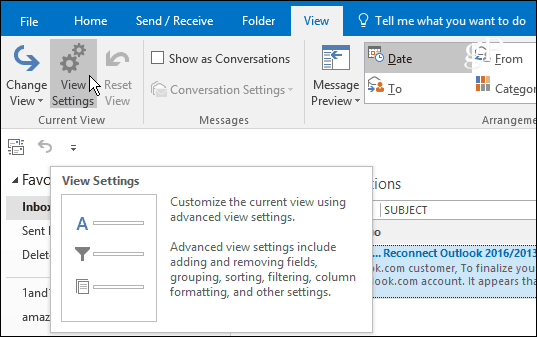 Brian thanks for posting How to Customize Outlook 2016 Reading Pane! I know I have seen that VIEW Tab before in Outlook and somehow ignored it. This post will certainly help me make positive Outlook changes. Thanks for the information Brian. Greatly Appreciated! Thanks for that great tip, Brian. I have finally organized my Outlook settings the way I like them to appear and am afraid to check the “Reset Current View” option in the “Advanced Views Compact” menu to find out what that option offers. Might that delete all my customized settings, and I would have to start customizing the settings again?. Many thanks Brian. I find Outlook to be the most confusing and difficult program to personalize. The settings are all over the place. This tip is going to help me enormously. Yes, after reading I did some customizing that I didn’t know about, should be a be a big help at work. It blew my mind when the application changed to a bunch of letters and words in columns, on a window…eh? Though I’d been in the View tab, I somehow couldn’t figure out how to customize the heading fonts on my own, either. Your suggestion about making rules which adjust fonts is just plain genius!! Sanity, here I come. Yes, I appreciate customization so the mail doesn’t all look the same. So much searching is wit-dulling, and tense. When I set the reading pane font to increase the screen blinks but no change is made. Is there a bug? I was looking for setting font in the Reading Pane. This info says it answers that question but does not. My thoughts exactly – this is about message preview, not the reading pane. I want to enlarge the font in the reading pane, fix it at that size and not have to play with increasing it every time I read a message. This did not provide me with a tool/approach to do that.. 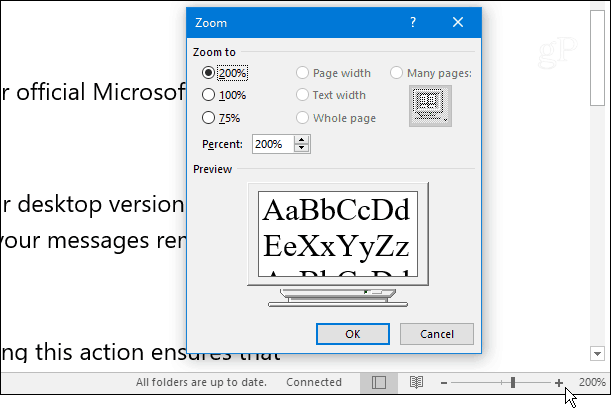 This article addresses changing the font in the PREVIEW area, and the font SIZE in the READING PANE. We need to change the font in the Reading Pane to Courier New so emails coming from a main frame system display correctly. Has anyone found a solution for this in Outlook 2016? Our user previously had this working, and thinks it was via a rule, but after getting a new work laptop, he is unable to duplicate it. Thanks in advance! This tip does NOT show you how to change the font size in the reading pane. It shows you how to do it in the Preview Pane. There is a difference. Note how the reading pane (which you call message body) did not change to comic sans. You can change it with the slider, or control-mouse wheel, but this change is only for the one message you are looking at, and does not “stick” when you click on other messages. I heard that they put in a default to change the reading pane font size in some recent build of Outlook, but I can’t find it anymore – all I can find on a web search is people complaining about the lack of ability to change the reading pane font size permanently.